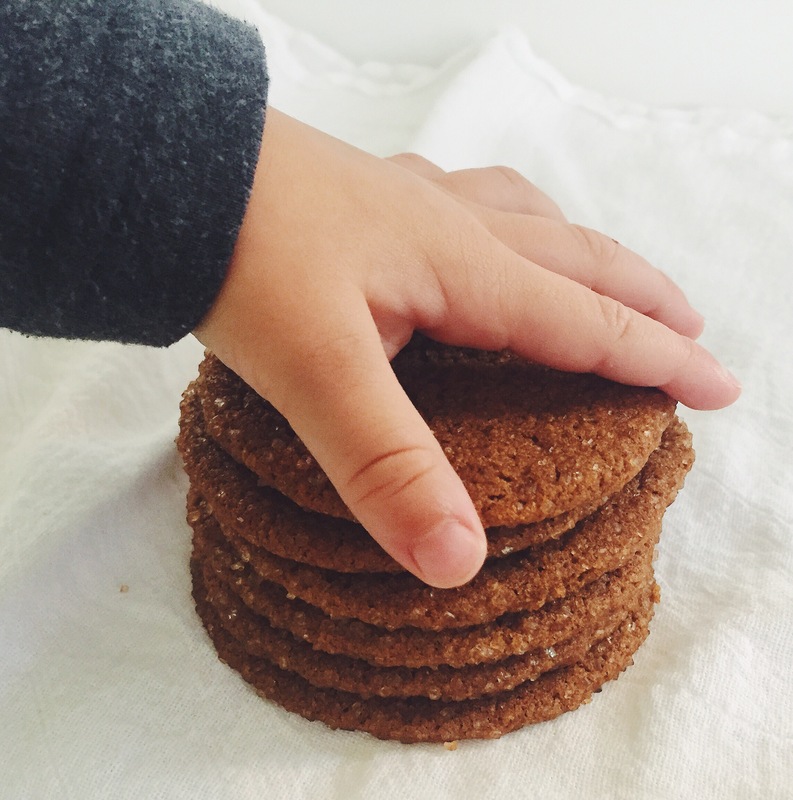 thin ‘n chewy gingersnaps – A Healthy Pinch. However, there is one tradition I am keeping alive and it’s baking cookies for family to celebrate the holidays. It’s my way of sending some homemade love across the country. Usually I make white chocolate peppermint cookies with vanilla salt and they’re such a hit. Their flavor screams Christmas and though they’re delicious sometimes the chocolate/peppermint combination can be a little overwhelming. 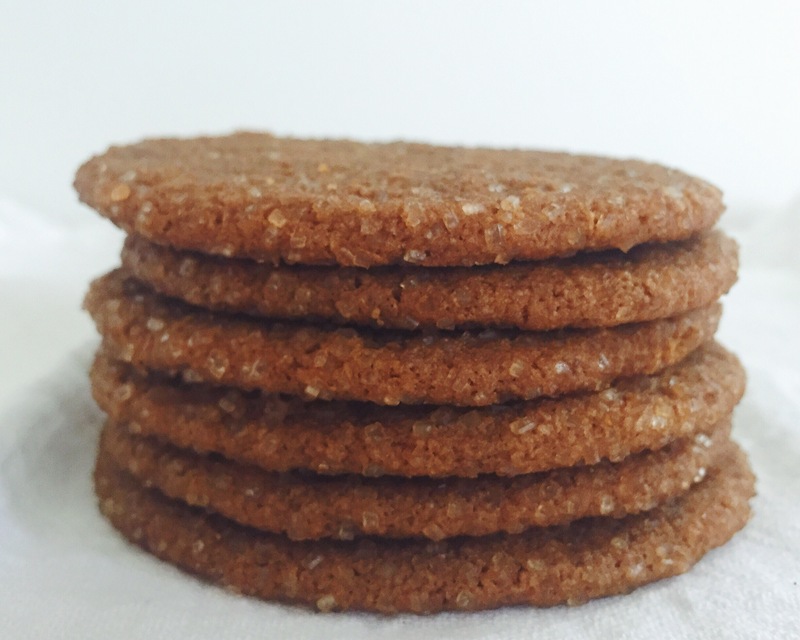 So I’ve also decided to throw in these thin and chewy gingersnaps to change things up a bit. I’ve made one batch and about four more to go. The cookie tins have been purchased so I really am trying to take steps to get over this procrastination hump. Now it’s just a matter of sending them out before I actually leave for Illinois! My little helper was trying to grab a cookie and run but when he realized I was actually taking pictures, he gave me his best hand model pose. Though these cookies are thin, they are rich with the flavor of molasses and cinnamon and ginger, just as they should be. Coated in a thin layer of turbinado sugar, the crunch of the first bite gives way to a chewy center. Since chocolate and peppermint saturate the season, I love these gingersnaps as a deviation from the norm. 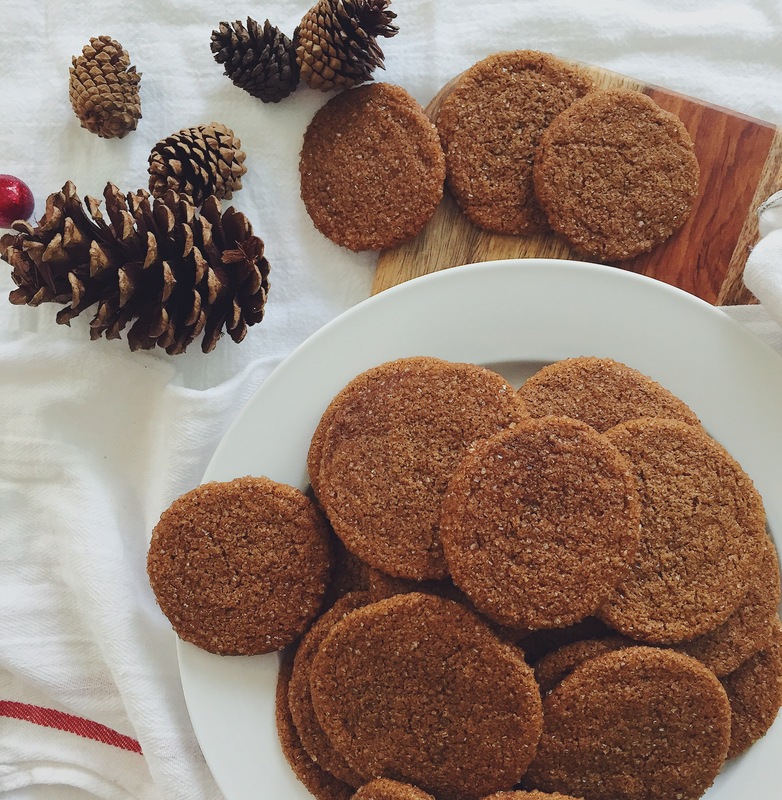 These gingersnaps are a perfect holiday cookie addition. Though they are best warm from the oven, they also make great cookie sandwiches. I used a cranberry-vanilla curd that I’ll be posting soon, but your favorite jam would work beautifully as well! Beat butter and natural cane sugar in a large mixing bowl on medium speed util well combined, about a minute. In a medium bowl, whisk together flour, ginger, cinnamon, baking soda and salt. With mixer still running, slowly add flour mixture to butter mixture and beat until smooth. Place turbinado sugar in a small bowl. Using a 1 tablespoon cookie scoop, roll dough balls between palms until uniform in size. Then lightly roll the dough balls in the turbinado sugar. Arrange 12 dough balls on prepared baking sheet, 1 inch apart; then flatten each cookie ball to ¼ inch thick. They will spread as they bake so you want to make sure they aren’t too close together. Bake 8-12 minutes, until fragrant and cracks appear on the top. Remove baking sheet from oven and allow the cookies to cool, undisturbed, for at least 10 minutes. They will harden as they cool. If making cookie sandwiches with the cranberry-vanilla curd (or your favorite jam), assemble only as many as you will eat in a few hours since they will get soggy otherwise. Dry cookies will keep in an airtight container for up to a month- if they last that long! Any time you want to make gluten free cookies…i’m all for it. It’s a pain,gluten free flour, but the brand you show’d me I found in Illinois. .make,banana bread…I stead of cookies. Recipes look yummy!